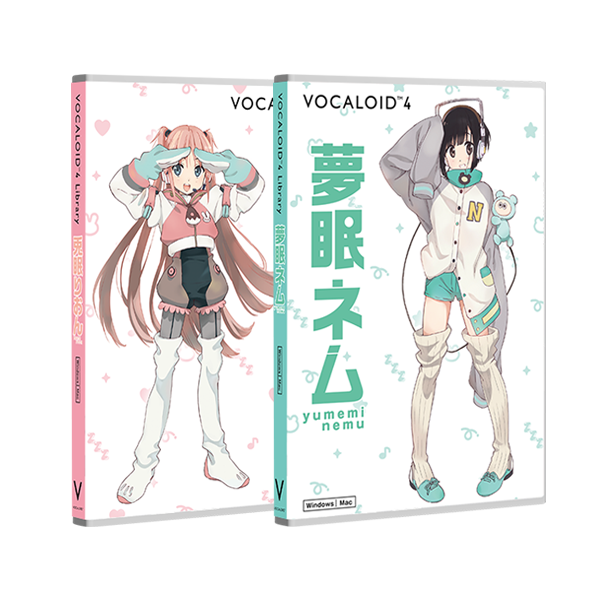 A special package of "VOCALOID4 Library tone rion" and "VOCALOID4 Library yumemi nemu"
that are based on Deanpagumi.inc’s Nemu Yumemi’s voice, Yumemi Nemu and Tone Rion! They can use the Cross Synthesis feature with each other! This product comes packed with over 130 sound clips, featuring shouts and chants that fans know and love. VOCALOID4 Library yumemi nemu perfectly reproduces Nemu's cute, nasally voice. Based on VOCALOID3 Library TONE RION, this new version now includes the Growl feature! However, her characteristic nasally, childlike voice is still going strong in VOCALOID4! Super idol in the new era who connects Akihabara and the world! as a pop icon connecting cultures regardless of genre. Bonus content may change without notice.